The City of Port Alberni’s practice of hiring specialized consultants for projects came under criticism during the recent budget process. But it is a way to reduce risk inherent to complicated projects, city manager Ken Watson said in defending the number of consultants the city hires. That’s the reason the city is spending $633,500 of its proposed $753,500 2015 consulting budget on engineering department work. 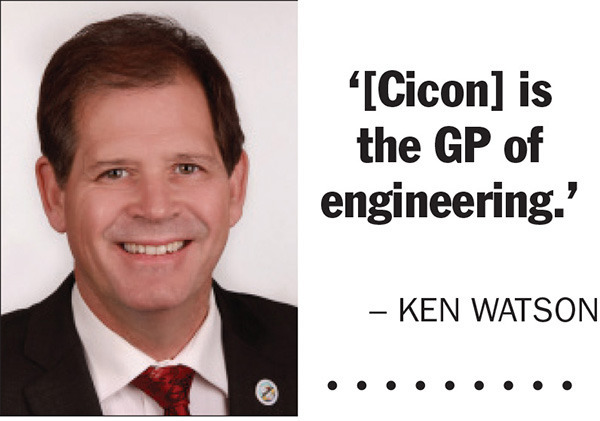 The role of a GP among doctors is the same role that city engineer Guy Cicon plays in the engineering field. “He’s the GP of engineering,” said Watson, also a licensed engineer (who actually preceded Cicon as Port Alberni’s city engineer). Cicon, Watson added, is also largely in a directorial and administrative role. According to Cicon, Port Alberni is not unique in its use of engineering consultants. “The engineer doesn’t have the capacity time-wise, or frankly expertise-wise to do it, so we have to go to a third party specialist engineer,” Watson said. Projects like the Dry Creek flood mitigation plans, the new Bainbridge water treatment plant and the sewage lagoon upgrades can’t be assigned to an engineering technician. Cicon, who has a Bachelor of Civil Engineering degree from Lakehead University in Ontario as well as a Masters in Business Administration from McGill University in Montreal, is licensed as a professional engineer (P.Eng). As such, he’s governed by the Association of Professional Engineers and Geoscientists of B.C. (APEGBC). The association governs professional engineers. In order to gain the P.Eng qualification, engineers must complete an appropriate degree and pass a licensing exam. In terms of hiring another engineer with a more specialized focus, Watson said that simply isn’t financially viable. Major projects take more than one engineer, Watson added. The best cost saving, Cicon said, is provided by getting the job done right in the first place.